How to create landing pages by APS addon? 1- First of all, you need to enable the feature. For enabling it, you can navigate to WPL->Settings->Global->APS addon and set Landing Page Generator to enabled. 2- In the property search page of your website, filter the listings as you like. For example you can use WPL Search Widget to filter the listings or use Map search of APS addon to filter the listing by a certain location. Also you can sort the listings and set the page size option if you like. 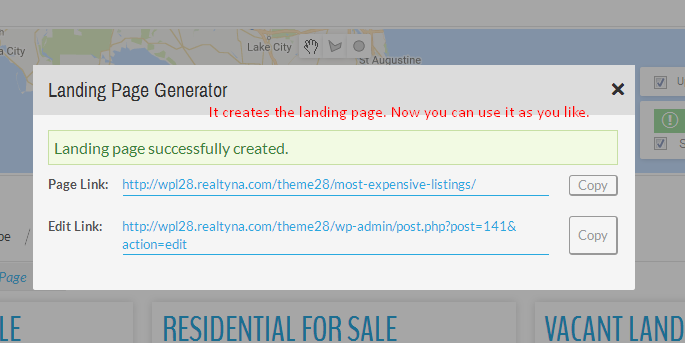 3- After all, click on the Landing Page Generator button below the sort options. Note: Only users who have "Landing Page" access can see this button so don't worry about your website visitors, they don't see it. If you don't see the button yourself, then please enable "Landing Page" access for your own user. You can check WPL user accesses article for more information. 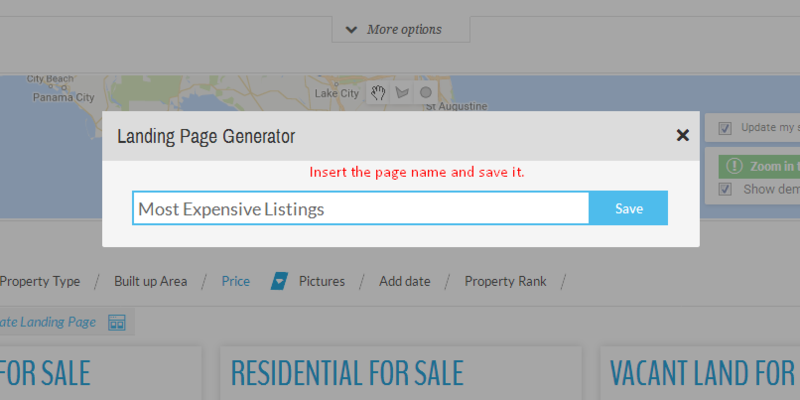 4- Insert a proper name for the landing page describing the listings that you filtered. 5- Then the APS will generate the page and provide you two links. One is the page link that you can share it with your clients and another one is edit link of the page. You can use the edit link to adjust the page if you like. Also you can see the generated landing page in your WordPress->Pages menu and you can always edit it or remove it if needed. Note: It's up to you how to use the generated landing page. You can create marketing campaigns, share the link on the social networks, send the link by emails etc.